ADAPT Programs is a leading drug and alcohol rehab facility in Houston, TX. By providing professional drug and alcohol rehab services, ADAPT Programs helps people reach a happy and healthy life free from addiction. 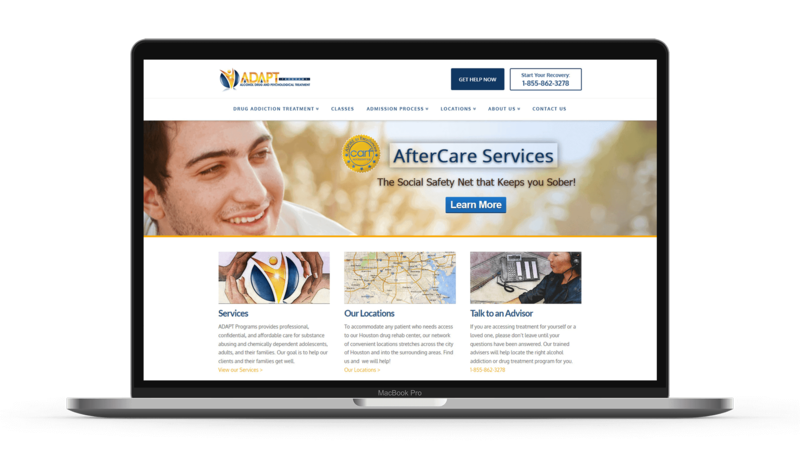 As a leading drug rehab facility in the greater Austin, TX area, ADAPT Programs needed to get found in search engines with optimized website content while also increasing the number of patients. As a growing business, ADAPT did not have a website, so their online presence was lacking. They needed a new website with fresh content that speaks to their customers and gets found in search engines. Scale your business to success with proven digital marketing strategies! While ADAPT Programs is a For-Profit organization, they have a mission to help people who are struggling with drug and alcohol addiction. Due to the sensitive nature of the project, we spent hours researching their organization’s brand, and developing a soft and relatable tone for their website content. Our SEO copywriting methodology and approach delivered content that speaks to people seeking help by getting found online and engaging their needs. The leadership needed to build their brand’s tone and message to be approachable and engage their readers. We used the research and writing marketing experience to help ADAPT Programs create compelling website content for their target audience while also optimizing that content for marketing on search engines. In total, we produced and optimized over 30 pages of engaging website copy for their business website. This content went beyond education and sales with the focus on building empathy and a trusting relationship to help patients or loved ones overcome the anxiety that comes with researching drug rehab facilities. We are proud of the content that we produced for ADAPT Programs because we know it is helping individuals overcome their battle with addiction to drugs and alcohol! Great website copywriting for drug rehab facilities starts with the unique needs of the target audience. Unlike many other industries, drug rehab facilities need specialized internet marketing that provides valuable information and addresses the particular requirements of the audience. Due to the nature of a drug rehabilitation service, we knew that we had to take extra care to develop content around the needs of their readers. Pixelchefs lead the project, but we worked to craft optimized content to showcase the value of ADAPT Program’s new website while also formatting content to read well and get found by search engine marketing. 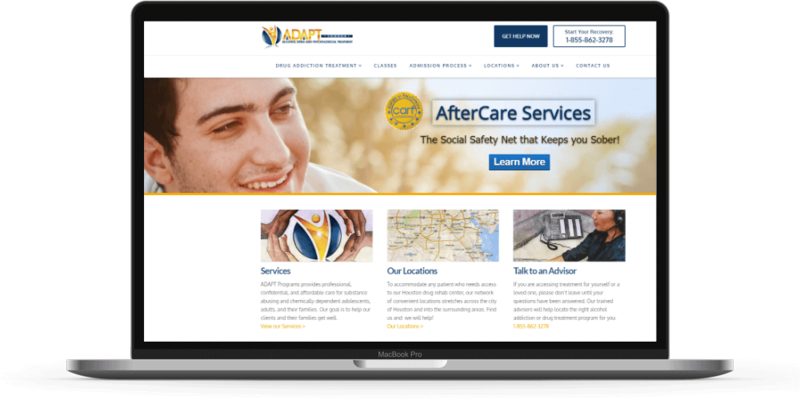 We produced engaging and SEO copywriting for ADAPT Program’s website while keeping a conversational tone. This approach helped build empathy with readers, and in turn, the site content had a bigger impact and helped increase bookings and outpatient care. Like many companies, ADAPT Programs was looking for a way to increase their sales while also driving more qualified traffic to their website. While they wanted content that would resonate and build trust with their customers, they knew they needed professional SEO copywriting services to help them get found in search engines. This is where our knowledge of SEO and freelance copywriting came into play because we were able to apply our years and experience to help them reach their target audience and drive conversions. 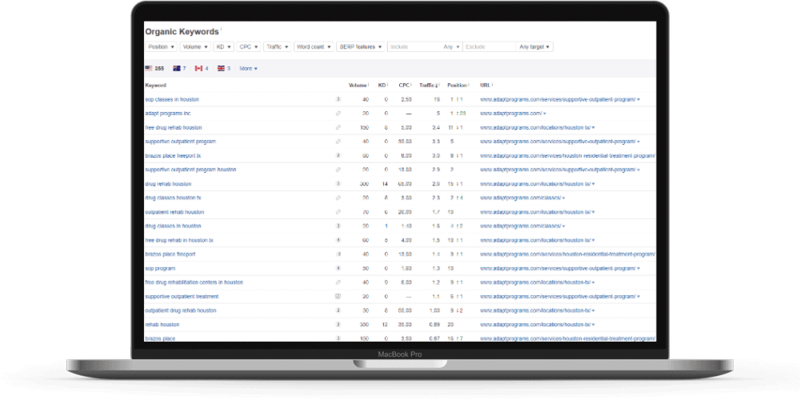 Using the latest white hat SEO strategies, we crafted content to assist them to rank for specific keywords and phrases that their customers use. Our methodology and approach to writing engaging website content for drug rehab facilities like ADAPT Programs resulted in ranking for competitive keywords and helped increase reservations Year Over Year. Together with PixelChefs, ADAPT Programs is reaching people in their community who need help to overcome the bonds of alcohol and drug addiction. We integrated SEO copywriting strategies to help the drug rehab facility appear in search engines and optimize their online content to help people convert and increase revenue. In the end, our professional copywriting services helps ADAPT build trust in their communities and drive qualified leads to the website. We are humbled to know that our Orlando copywriting services were used to help attract people in need of Houston’s leading drug and alcohol rehab facility! Grow your online presence and drive more qualified leads to your site today!